A new coastal garden booklet aims to inspire the Broome community to set the town ablaze with colourful native wildflowers, bushtuckers and shrubs. 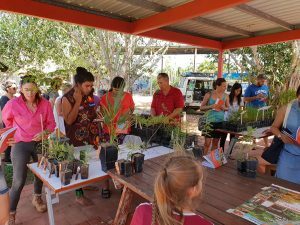 Coastal Gardens – A Planting Guide for Broome has been written to inspire the community to grow a waterwise garden that benefits their wallet, the environment and Broome’s coastal waters. 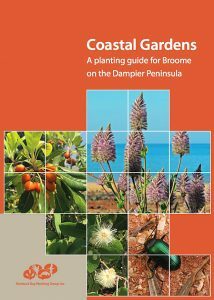 The book was launched on 8 Feburary at Broome Lotteries House with free local coastal plant giveaways. Author Kandy Curran from the Roebuck Bay Working Group said local natives (endemics) have many benefits. She said there are few places on our earth with such productive coastal waters surrounding a large population centre, so including simple tips to reduce impacts on Broome’s coastal waters is vital. “The tips are simple, grow local coastal plants that don’t require fertiliser or chemicals, mulch heavily and trap rainwater to reduce nutrients entering Roebuck Bay,” she said. Local coastal plants have evolved over time with defence mechanisms to cope with common pests, thereby requiring fewer pesticides than introduced species. “Less pesticides used in your garden, means less chemicals entering Broome’s coastal waters via roadside stormwater drains,” she said. Other fantastic benefits with local coastal plants are more birdsong, butterflies, croaking frogs, and small lizards in your garden. “With the 2018 wet season exceptionally wild, windy and wet (three cyclones and 1719mm of rain) in Broome, it has been opportune to identify the endemic plants that did well in these tough conditions and the exotics that did badly,” Kandy said. She said the booklet will be exceptionally helpful, with local native plant experts assisting with the selection of plants on the basis that they will easy to grow, maintain and purchase. The book has been exceptionally collaborative, with expert help from native plant enthusiasts Tom Harley (Kimberley Environmental Horticulture), Philip Docherty (Society for Kimberley Indigenous Plants and Animals), Christine Howe-Piening, Andrew Mitchell (Northern Australia weed specialist), Bruce Greatwich & Nicole Godfrey (Department of Biodiversity, Conservation and Attractions) Tim Willing and Dr Malcolm Lindsay (Environs Kimberley). Designs for Broome gardens drawn by Chris Howe-Piening and Phil Docherty from the Society for Kimberley Indigenous Plants and Animals will be useful too, as will the ‘Gardening to keep Broome’s coastal waters clean’ section. The book is available online and is designed to be smart phone friendly. This project has been funded by State NRM with support from Royalties for Regions and Rangelands NRM through funding from the Australian Government’s National Landcare Program.